Jede der hier vorgeschlagenen notwendigen Maßnahmen zur Klimasteuerung würden -wenn allein die deutsche Bevölkerung sie tragen würde (80 Millionen Menschen)- zwischen 0.3 und 3 Euro pro Person und Tag kosten. Cost of abatement (i.e. CO2 reduction) = annual additional operating cost (including depreciation) minus potential cost savings (e.g. from reduced energy consumption) divided by the amount of emissions avoided. Possible costs for implementing a system to realize the abatement approaches are not included. 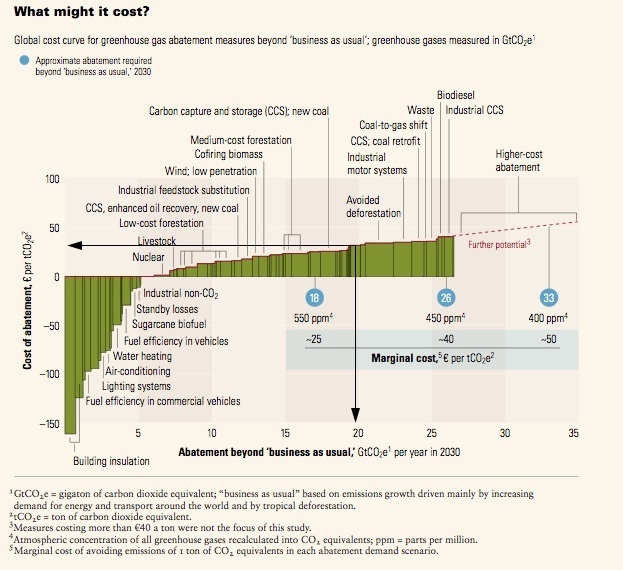 The cost curve shows estimates of the prospective annual abatement cost (Euros per ton of avoided emissions of greenhouse gases), the abatement potential of these approaches (gigatons of emissions per year) and the marginal cost of an approach. 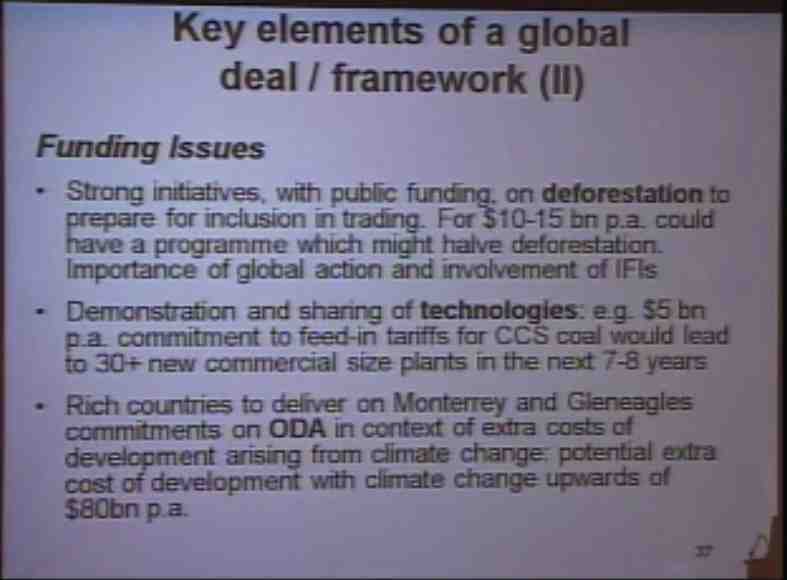 Arrows refer to an example pointed out by Nicholas Stern in this talk. The abatement cost for wind power should be understood as the additional cost of producing electricity with this zero-emission technology instead of the cheaper fossil-fuel power production it would replace. The abatement potential of wind power is our estimate of the feasibility volume of emissions it could eliminate at a cost of 40 Euros per ton or less. Looked at another way, these costs can be understood as the price - ultimately, to the global economy- of making any approach to abatement cost competitive or otherwise viable through policy decisions. A wide range of assumptions about the future cost and feasible deployment rates of available abatement measures underlie the estimates of their cost and significance. For example, the significance of wind power assumes that actions to abate greenhouse gases will have already begun across regions by 2008. The volumes in our model (and this graphics) should be seen as potential abatement, not as forcasts. 6 gigatons - or almost a quarter of the total abatement potential at a cost of 40 Euros a ton CO2e or less - could be gained through measures with zero or negative net life cycles cost. This potential appears in transportation and in buildings. No New Technologies Required for 70% of the Reductions. We found that some 70% of the possible abatements at a cost below or equal 40 Euros a ton of CO2e would not depend on any major technological developments, they rather involve very little technology (e.g. forstry or agriculture) or rely primarily on mature technologies. ... The remaining 30% of abatements depend on new technologies. ... The point is ... that low tech abatement is important in a 2030 perspective. Nicholas Stern: "I'm not saying that McKinsey got these numbers right. The important numbers there they got wrong. The point is that you can construct options like that and go outward on that curve and say 'when this [e.g. 20 Gt CO2e, arrow pointing toward x-axis] is the kind of cut we aim for, you get the marginal cost [30 Euro per tCO2e, arrow pointing toward y-axis] of getting there' ... [i.e.] what it would cost you for the last bit [of the cut]." According to RECIPE (Report on Energy and Climate Policy in Europe) assumptions, CO2 emissions without climate protection measures would grow to 2.500 metric gigatons (Gt) by 2050 and result in a global rise in temperature of up to 7 C over pre-industrial levels. The latest scientific findings suggest that to achieve a high probability of limiting the rise in global temperature to 2 C, additional emissions until 2050 must be held below 750 GtCO2 [330 GtC]. "The earth's atmosphere is a limited repository. Until the end of the 21. century we might be allowed to deposit approximately 850 GtCO2 [to limit the global temperature rise to below 2 C]. The dramatic background is that we deposited in the past 10 years [2000 - 2010] already 270 GtCO2. [So, ] in the next 30 to 35 years we might be carbon insolvent." Ottmar Edenhofer, "Wissenschaftler fordern drastischen Klimaschutz", Umwelt und Verbraucher, Deutschlandfunk, Nov. 23, 2009 (in cache). "Dieses Ziel wird eine große Anstrengung erfordern" (in cache), Klimaforscher zur Zwei-Grad-Begrenzung der G8-Staaten, Ottmar Edenhofer im Gespräch mit Sandra Schulz. Nicholas Stern: "It isn't safe, it's safer ... 75 to 80 % [cuts in annual emissions] is the minimum required, and it's the minimum the poor countries are asking. They're very, very mad about this whole story, and rightly so. The rich countries are responisble for filling up this atmosphere, running down this world, and it's the poor countries that are hit the earliest and the hardest. And unless a global deal recognizes that inequity, it will not stick as a global deal. ... the importance of trade providing the kind of financial flow that gives poor countries the incentive to come into this deal, sharing the technology.... This is the target's market side of the story. The last bullet point is a technical one about how you need to reform the trading mechanism to make it capable of carrying the load which I think it will have to carry. It's a radical reform of the clean development mechanism. 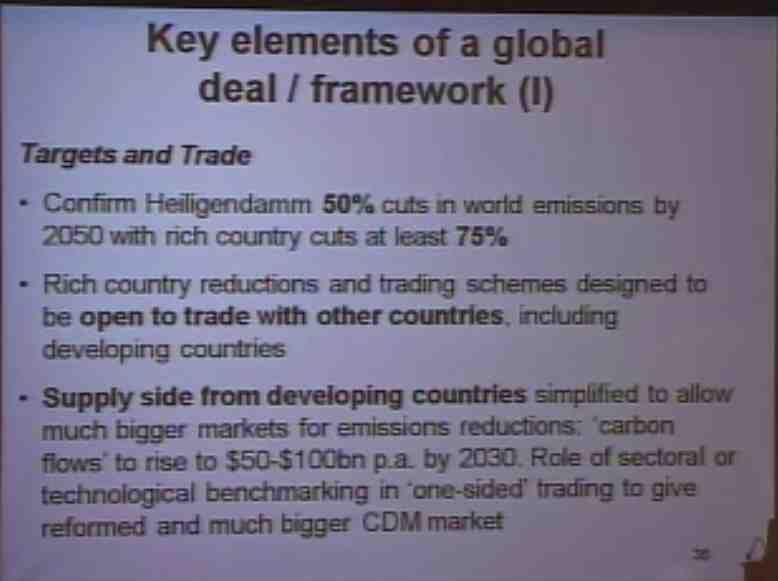 Nicholas Stern: "With 10 ... 15 billion dollars per annum we can cut deforestation by half. That will give us carbon reductions at a price of 10 ... 15 dollars per ton of CO2." (Anmerkung: Wenn Deutschland allein das Geld für das Wald-Erhaltungsprogramm aufbringen würde, kostete das jeden der 80 Millionen Deutschen 34 ... 51 Cents pro Person und Tag.) "You have to go into the evidence quite carefully, for this to be true you'd have to do some experiments, to make sure you're using the right kind of methods, and you have to have those experiments run by the countries in which the trees stand. It'd be quite wrong for those outside to go around telling people about how to do that, but there's the obligation of those outside to support those who try to take on these tasks. ... around half of it could be done at about 5 dollars per ton CO2 equivalent (umgelegt auf 80 Millionen Deutsche wären das 14 Cents pro Person und Tag). McKinsey doesn't agree with that but I think they got it wrong. and we ought to be as economists and public policy people concentrating very hard on just how we share the technologies. there's lots of difficult eonomics in public policy to make that happen. ... we need to operate much more quickly. The climate is going to change on us, ... and it's going to be particularly difficult for the developing countries. I draw your attention to the "Human Development Report" which was published by UNDP about a month ago. They argued that in 2015 (we are talking about 0.8 or 1 degree centigrade temperature increase) that the extra costs facing the developing countries because of climate change might cost them another 85 billion dollars a year (umgelegt auf 80 Millionen Deutsche wären 2.74 Euro pro Person und Tag). I think that's quite conservative. That's roughly the same order of magnitude as total overseas development assistance. If we doubled overseas development assistance by 2015 the costs of climate change eats up roughly half of the new level of development assistance. These [climate change related costs] are costs -we're talking about the near future now- imposed on poor countries by rich countries . That is a responsibility -it seems to me- that we have to look at directly. And again, if we are talking about the equity characteristics of the global deal that would bring developing countries into the story, I think at least delivery on the promises of overseas development assistance is absolutely necessary, and we can't wring this out of the environment ministers' discussions, it has to be a seperate discussion in terms of different ministeries integrated in that environmental discussion."